- All kinds of washing cars, motorcycles, electric vehicles. - Home cleaning, cleaning the bathroom, kitchen, balcony, hallway, windows, floors. - The family lawn, garden spray. Balcony flower watering, dust. - Wash your beloved pet. - Save time and money: Portable and easy to use,fast connect all kinds of connections. you can mix and match a variety of pipes, arbitrary length. - No power or other power sources, there are places where water can be used, and professional cleaners have the same effect, but easier to use for a wider range! ★ Built-in Soap Dispenser, mixes soap or fertilizer, 3-way foam flow control switch. The best soap for washing cars. 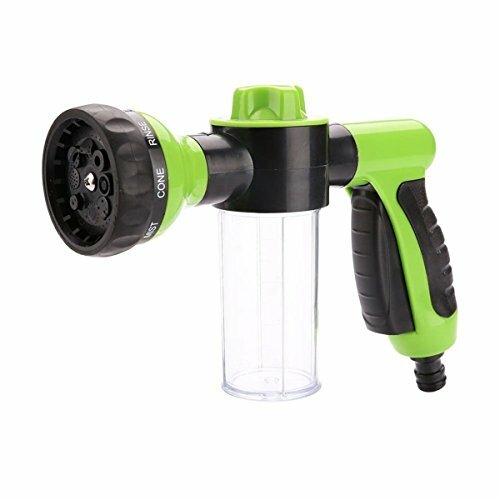 ★ 2-6 Kgs High Pressure Washing Gun - Best for all kinds of outdoor washing and cleaning, such as washing gutters, windows, house exteriors, cars, boats, sidewalks, stairs, and sliding doors. ★ Trigger Lock - No need to keep squeezing the pistol front trigger during spraying, just press it down to start the water and press it again to shut off which helps reduce hand ache during longer use, makes watering much easier and far more comfortable. ★ Lenmumu provide best customer service and 12-month warranty for quality-related issues. Please feel free to contact us if any problems, we always response within 12 hours. If you have any questions about this product by Lenmumu, contact us by completing and submitting the form below. If you are looking for a specif part number, please include it with your message.